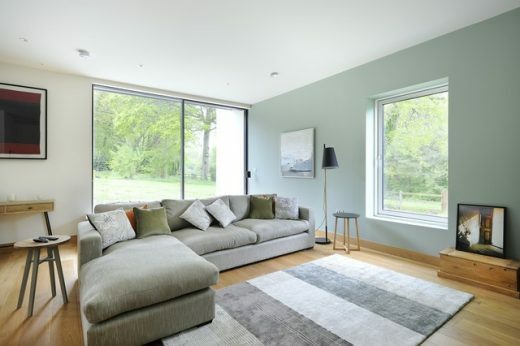 Idyllically located, Brackenhurst is a low energy new home located within a heavily conserved and protected area on a 1.75 acre New Forest plot surrounded by natural ancient woodland and meadows. The owners are both keen sailors and passionate environmentalist purchased the plot in 2011 having falling in love with the coastal location. 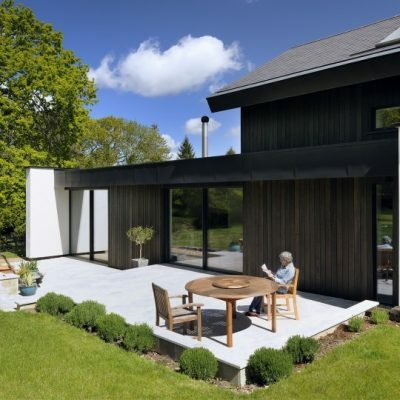 This is a home that sits humbly within its New Forest setting and is firmly rooted to its site. 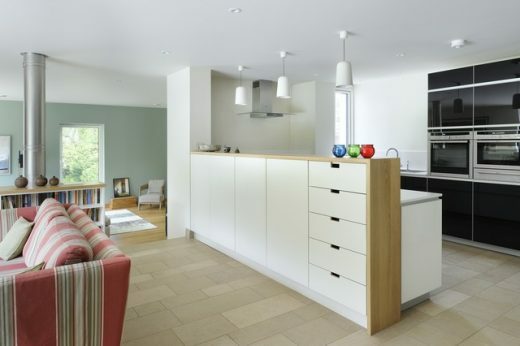 A heavy wrapping wall protects, shelters and grounds whilst contrasting with the dark timber box inserted within. 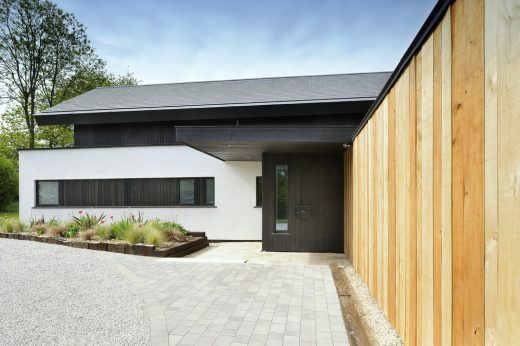 The lime rendered wall which references the use of cob construction locally is eroded to the south to reveal the dark stained local Douglas Fir timber inner layer which is in turn pulled apart to allow a more open connection with the south facing garden. Windows in the fortress like garden wall read as punched holes – depth is achieved as the timber construction and natural insulation result in a wall build-up of real substance. 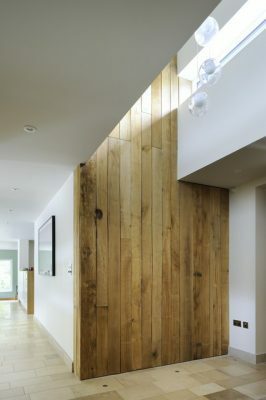 A reclaimed timber spine wall slices through the building reaching out and connecting into the landscape. 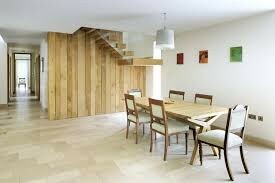 The main staircase is cantilevered from the wall and wrapped around it. 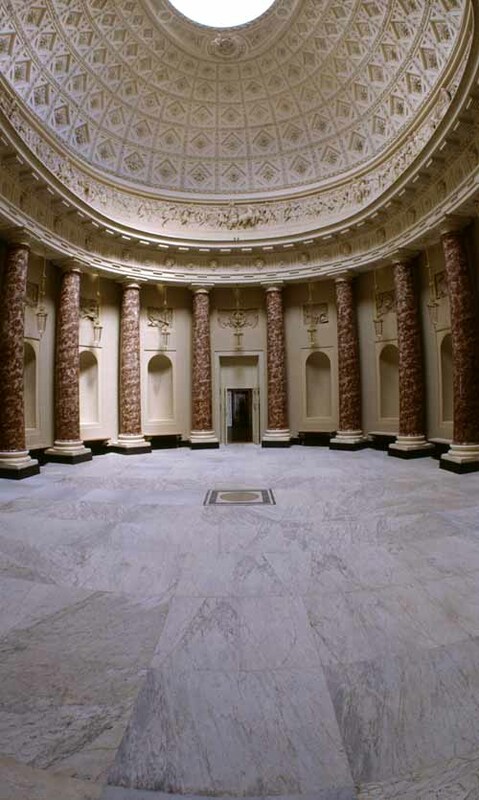 In addition to providing natural textures and colours the wall welcomes on arrival whilst also screening an existing stable block (now used to house the biomass heating system). 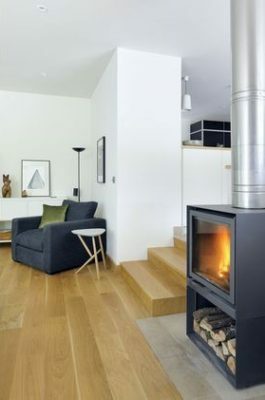 The client, who kept an online blog of the construction process throughout the build, required a lifetime home which demanded little or no energy to run, and could be capable of being removed completely from the grid, if required. 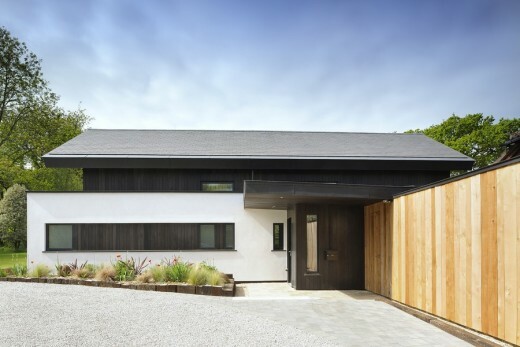 They also wished for the house to draw on the local vernacular of the surrounding barns and farm buildings, and for the house to be modest and rooted firmly in its location and site. Local materials were sourced for use throughout, the mileage of each was tracked for CSH compliance, and the house was built using local craftsmen and labour. 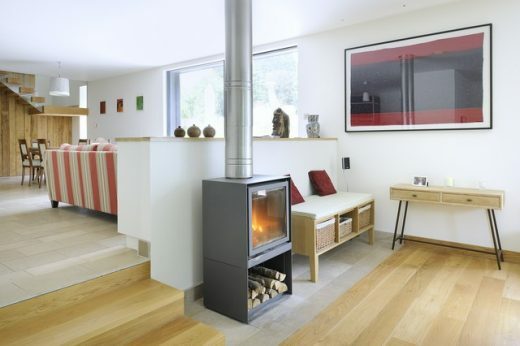 The clients lived on site in a caravan throughout construction, helping with the build. 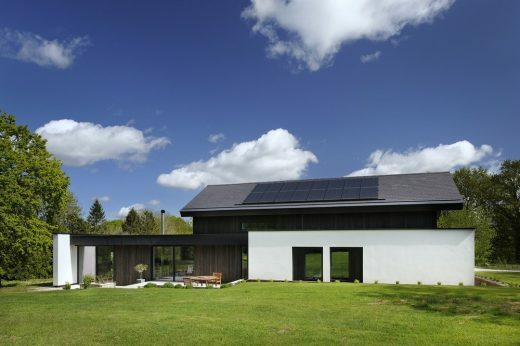 The project is designed and constructed on a tight budget with a Passivhaus philosophy. 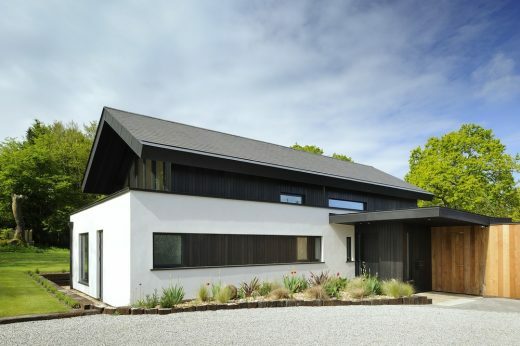 This was one of the first homes within the New Forest & Hampshire to achieve pre-construction PassivHaus compliance. Heavily insulated I-joist walls filled with recycled paper (Warmcell) provide u-values of 0.09 to walls and roof. 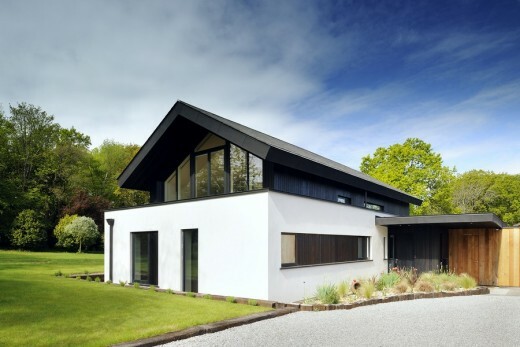 Details were developed to minimize thermal bridging and maintain an air tightness below 1 m3/hr/ m2 @ 50Pa. 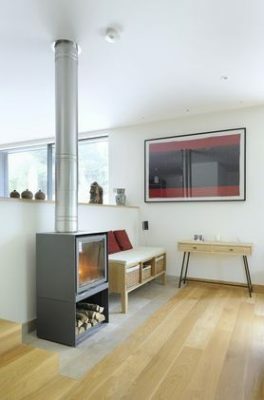 The house was installed with a wood-burning stove in the open plan living/dining space and with the heat of the occupant this is sufficient to heat the house via an MVHR system which re-distributes warm air. The building has rainwater harvesting which is used to flush wc’s and wash clothing. A natural reed bed is utilized for waste treatment, 3.8kw of solar PVs provide meet electrical requirements feeding back to the Grid at time of surplus, and a biomass pellet boiler is used for hot water requirements and to provide stand-by heating on the rare occasion it is required (when the building is not fully occupied). 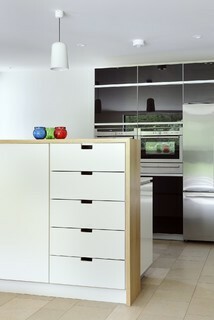 Materials were carefully selected to minimise the amount of toxic chemicals. Triple glazed windows and sliding doors were carefully selected to minimise heat loss and the contractor, client and architect all attended a hands-on workshop on airtight construction to ensure good standards were achieved on site.